There is an obvious economic explanation for George Lee's decision to throw his political toys out of the pram: the value of his 'assets' would have declined sharply by the time of the next election and he therefore decided to protect their value by returning to private life. His assets being his intellectual credibility and reputation (and the profile that went with them). He was finding that the opportunity cost of staying in politics was rapidly exceeding the benefit of same. That's one explanation anyway. The cultural development in question is the systematic over-estimation of the importance not so much of emotion, as of the expression of emotion – one’s own emotion, that is. The manner with which something is said has come to be more important than what is said. Saying nothing, but with sufficient emotional vehemence or appearance of sincerity, has become the mark of the serious man. Our politicians are, in effect, psychobabblers because we are psychobabblers; not the medium, but the emotion, is the message. ... Of course, the emotion with which an utterance is made has always been important in our assessment of how much to trust or believe the utterer of it. But whereas emotional expression was once the servant of meaning, now it is the other way round: meaning is the servant of emotional expression. To paraphrase Terence MacSwiney, it's not those who think the most, but those that complain the most, that shall prevail. But only up to a point. In the end, George Lee's departure represented a failure of imagination. A failure on the part of Fine Gael, obviously, but more so a failure on the part of George Lee. Firstly a failure to imagine what it was he was letting himself in for when he entered politics (surely his career spent interviewing politicians must have given him some insights?) A failure to negotiate a 'deal' with Enda Kenny before standing for election that he could have either insisted on enforcing or have legitimately walked away from if it was not honoured (but I don't sense there was one). And most importantly a failure to organise. George was (and is) a celebrity in the sense of being a one-man-band of energy, activity and opinion. But in politics that is not enough. His biggest failure in the end was his failure to build an organisation and to channel the genuine hope and commitment of thousands of people who would have given him far more political clout than any front bench portfolio in opposition. It might even have been the catalyst for the political and economic transformation he seemed so earnestly to have wanted. I just hope for him personally that his assets are not in negative equity by the time the dust has settled. You'd surprised how little time George Lee spent interviewing politicians. He would have spent a lot of time analysing their decisions, budgets and financial acumen, but very little actually conversing with them. Economics Corrs are always at a further remove to the political circus than many expect. The pol corrs are the ones in the mix. The biz journos are outside the ropes. The reason George Lee has left politics a disillusioned man is because he now realises that power and influence are incredibly circumscribed in our political system. Political advancement is almost entirely dependent on toeing the party line; not rocking the boat; sucking-up to the right people, etc,. 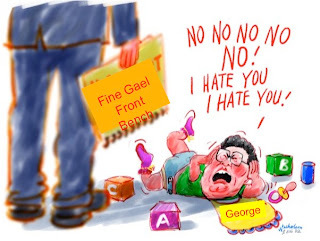 George was frozen out of policy by the Fine Gael leadership not so much because of his views (although Alan Dukes said he was "talking rubbish") but rather because granting early preferment to him would have put noses out of joint among all the timeservers in the party who have obeyed the unspoken rules referred to earlier. George Lee's unveiling as FG candidate last May was seen by the public as a vindication of their frustration with Government incompetence and inaction. However, to the Fine Gael parliamentary party, it was simply a political 'stroke', a great way of putting one over on Fianna Fail. Ironically, once Lee had won the Dublin South by-election for them, they just lost interest in him, and treated him as if he was just another thick county councillor from down the country who would be delighted at getting the big pay packet at the public expense! George Lee was naive and perhaps egocentric, but we should thank him for exposing the self-serving core of Irish parliamentary politics, and throwing into such stark relief the crying need for radical change. Its unclear to me that we have much to thank George Lee for. After all , I think most of us who are not in short pants have a pretty good idea what politics is like in Ireland. But we now have a bye-election which we really don't need. Has any TD ever sat for such a short time [by choice]? If every TD who wasn't feeling fulfilled after 9 months in the job was to quit there would be a helluva lot of bye-elections. I voted for Lee because I thought he had a lot to offer, he's very bright and passionate about public policy so I am disappointed that he didn't stick with it. I don't think it was too much to expect him wait a bit longer. They are only in opposition anyway. George Lee spent all day on Tuesday in front of a camera or microphone explaining himself. I heard a fair bit of it and still don't know what his alternative economic policy was, despite his ample opportunity to articulate it. He's also scaled a veritable Everest of hypocrisy. Yes, someone who lambasted the government for their management of the public finances has just personally imposed the cost of an unnecessary bye-election on the taxpayer.